BGP Weight Attribute is a Cisco Proprietary attribute that influences a router how to reach a certain prefix. The difference between Local Preference and Weight is that the former is propagated within an AS and the latter is router locally significant. Weight can be used if there is one router connected to two or more AS’s or just to just one with two or more eBGP peers. Now, lets configure weight and later use a route-map for more complex use of weight. Local Preference is a Well-known Discretionary attribute, Weight doesn’t belong to any category. Default Weight for locally originated routes is 32768. Zero is the default for other routes. Weight is not propagated to other routers within the AS. In this lab, BGP Weight Attribute will be configured and will be using route map for more flexibility. Check the diagram below for details. 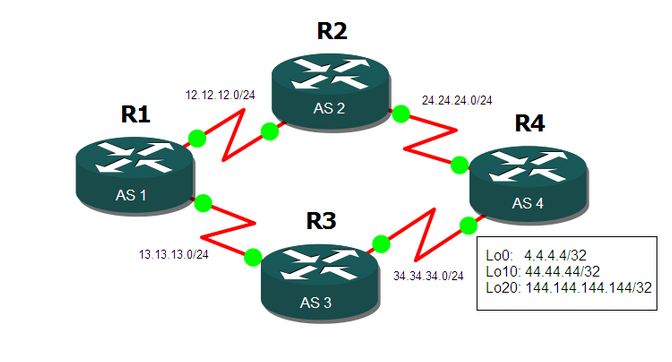 configure a route-map to so that R1 with take AS 3 to reach 144.144.144.144/32. Lets see how R1 reaches the prefixes announced by R4. Ok, it takes AS3 to reach the prefixes. Now, lets configure Weight to make AS2 the more preferred path to reach the prefixes. Now let’s see if that changes after clearing the BGP session “softly”. It’s now taking AS 2. Let’s configure a route-map so R1 will take AS3 to reach 144.144.144.144/32. The weight should be 200. We will apply the route-map towards neighbor 13.13.13.3. The ACL is to filter which routes be given a weight of 200. The reason the route-map was configured inbound direction because we are receiving the routes from that neighbor. Let’s see what happens to the BGP table. Now, R1 will take AS3 to reach 144.144.144.144/32. Notice that the weight now is 200, and its more preferred.